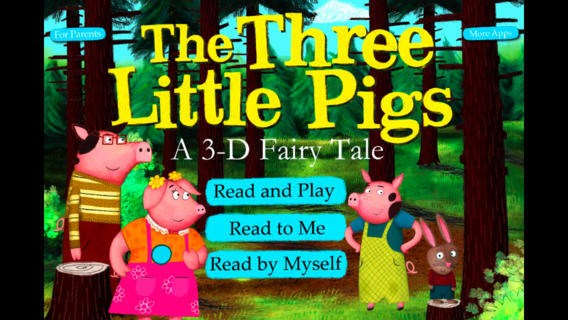 FREE for a limited time – The Three Little Pigs from Nosy Crow, a fabulous must-have version of the classic tale. Kids 3+ will be delighted with this animated story that is full of interactivity & fun surprises. The story can be enjoyed in 3 modes: read & play, read to me, and read by myself. As they read, kids can interact with the story in a variety of ways. They can flick the characters to make them jump, spin and/or speak. They can tap to help the pigs build their houses. They can even help the wolf blow down the pigs’ houses! There are so many fun things to try. The artwork & animations are top-notch. The app even has an original soundtrack which features a musical identity for each character. This educational app is an example of digital storytelling at its best. Don’t miss this one – your little ones will love it!